Menswear trends change each season, and for those fashionistas out there who love to experiment with their style this is music to your ears, as it ensures your style never gets stuck in a rut. 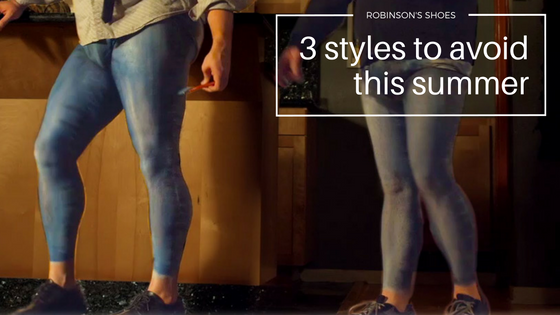 There are however some trends which we could really do without seeing this season, so while we’re all for embracing fashion and finding the right look for you, here are 3 styles to avoid this summer if you want to retain your fashion dignity. The trend for squeezing yourself into a tiny pair of jeans thankfully seems to be abating, so if you’re still hanging on to a pair of skinnies that you think you look great in, take a deep breath and let them go. Relaxed fit or straight leg jeans will still give you a nice shape without looking like you’re in extreme discomfort, so skinny jeans are definitely a style to avoid this summer. Going sockless has really taken the menswear world by storm, but it might be time to ditch this trend. Of course, socks and sandals are a well-known no-go area, but we really think good shoes deserve a pair of socks, and not just for the additional fashion benefits. When you wear shoes without socks, your feet will sweat, and yes they will start to smell, as will your beloved shoes. If you really can’t bear to part with this trend, invest in some invisible socks, which you can wear discreetly to absorb some of the sweat and keep your shoes from turning into a bacteria playground. Muscle tee’s were all the rage until recently, which is basically when you wear a t-shirt that looks like it’s three sizes too small in order to emphasise your arms. Guys, this need to stop. Buy clothes that fit and flatter you this summer to make you feel confident and look great without looking like you’re trying too hard. Also to be avoided like the plague are t-shirts with deep v-necks – if you feel uncomfortable in a round neck shirt, choose a subtle V shape rather than a plunging one. What trends should you embrace instead? There are plenty of great styles to try this summer instead – the khaki trend is versatile and suits most shapes and colourings, or how about ditching your leather jacket for an on-trend bomber jacket instead, thanks to the 90’s revival which has been so popular this season?